If you are looking for a way to erase sleepiness in the daytime or to stay awake in the nighttime, you may have been advised by some people to take either Provigil or Nuvigil. Of course, a medication can help you combat sleepiness, including the ones caused by sleep disorders. Such kind of medication can also help you feel more alert and concentrate better in your work. Still, you should make sure that you get enough sleep – the lack of sleep can cause various health problems. But, if you already get enough sleep and you still have problems with excessive daytime sleepiness, you can use Provigil or Nuvigil for first-line treatment. Even though these drugs generally do not cause addiction, they do have the potential to cause addiction if misused. That’s why both Provigil and Nuvigil are controlled drugs, a.k.a. drugs that are regulated by the government. Both are prescription drugs, though, interestingly, they are available as over-the-counter drugs in some other countries. So, we can assume that Provigil and Nuvigil are relatively less risky than their stimulant counterparts such as Adderall and Ritalin, but we still have to be careful to use these products as directed. Both Provigil and Nuvigil actually have similar functions. Both of these drugs are used to keep you awake and to treat sleep disorders such as narcolepsy, obstructive sleep apnea (OSA), and shift work disorder (SWD). Narcolepsy is a chronic sleep disorder that makes you experience extreme daytime drowsiness and sudden sleep attacks. You can be awake at one time and suddenly fall asleep at the next second. Obstructive sleep apnea (OSA) causes the throat muscles to relax when sleeping, thus making it difficult for you to breath. You may stop and start breathing when sleeping, and such experience is very disturbing if not frightening. If you have such problem, you are likely to have issues with daytime sleepiness, too, due to the lack of quality sleep. Meanwhile, shift work disorder (SWD) is a sleep disorder that usually affects people who work in shifts and who work at night. Such schedules may lead to sleep difficulties; you may find yourself fully awake when you are supposed to sleep and feeling utterly sleepy when you are supposed to be awake. By consuming a medication like Provigil or Nuvigil, you can make your body awake and alert during the hours you are expected to be functioning, and only crash down to your bed after the effect diminishes at the sleeping hours. Of course, for treating serious sleep disorders, Provigil and Nuvigil are meant for long-term treatment. They are used in a therapeutic way, gradually shifting your sleep hours to the ideal time. But Provigil and Nuvigil are also used by people to erase sleepiness at work hours. Interestingly, Provigil has been used for several off-label applications, too. It has been used by astronauts going on long-term missions aboard the ISS to optimize their performance while fatigued and to treat the disruptions in their circadian rhythms. It is also currently the only approved drug by the Air Force for fatigue management. Several countries have expressed interest in using modafinil – the substance inside Provigil – to replace amphetamine – the drug that has been used since a long time ago to treat sleep deprivation in combat situations. In the wider field, modafinil has also been used to treat neurological fatigue on people with multiple sclerosis. The patients who receive low-dose modafinil can feel less fatigued than the patients who don’t take the medication at all. A higher dose, in this case, does not contribute to a more significant improvement than the lower dose. Other off-label uses include treating sedation and fatigue in various conditions, such as depression, chronic fatigue syndrome, spastic cerebral palsy, and Parkinson’s disease. Nuvigil, being relatively newer, has not been used as widely, but we can expect the same from Nuvigil sooner or later because Provigil and Nuvigil have various similar properties. As a matter of fact, Provigil was released for the first time in the late 1990s as a medication to help treating narcolepsy. On the other hand, Nuvigil is actually made by the same manufacturer as the one who produces Provigil. Nuvigil has been approved by the FDA since 2007 as a cure to unexpected daytime sleepiness related to narcolepsy. 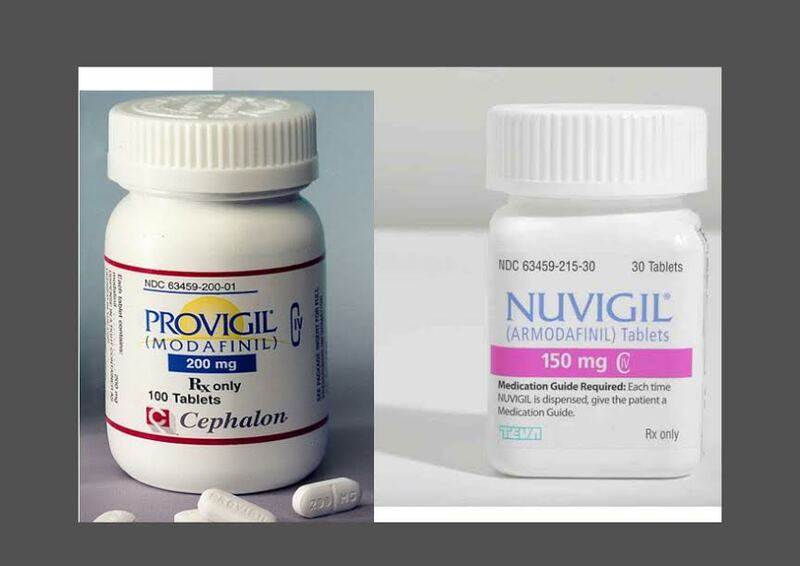 Even though Nuvigil was initially projected to be the more successful successor of Provigil, both drugs are continuously used by many people. 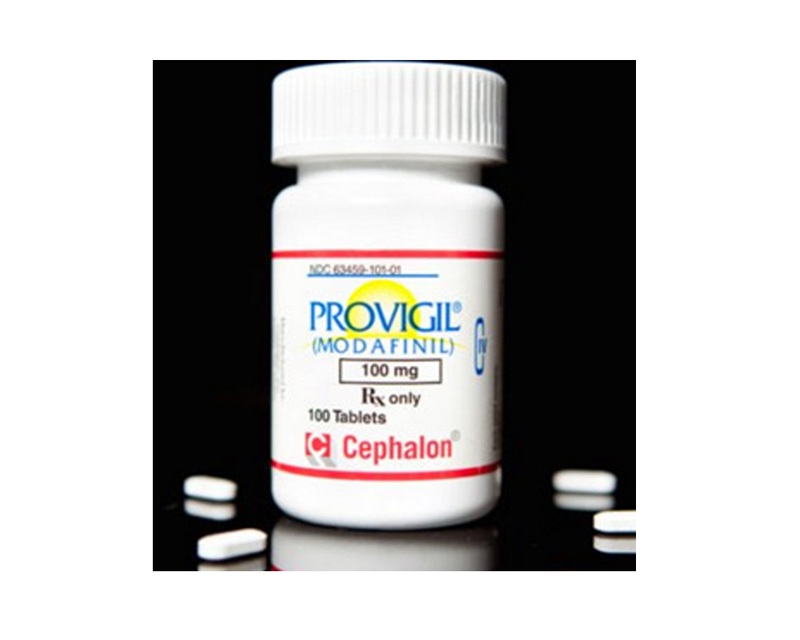 The chemical substance inside Provigil is actually modafinil, and you can actually get the generic version of Provigil in the form of modafinil. Provigil is available in 100mg and 200mg dose options. On the other hand, the chemical substance inside Nuvigil is armodafinil, which is the R-enantiomer of racemic modafinil. If that sounds complicated, here is the simple English version: it is a similar substance with just slightly different chemical structure. Nuvigil is available in 50mg, 150mg, 200mg, and 250mg dose options. 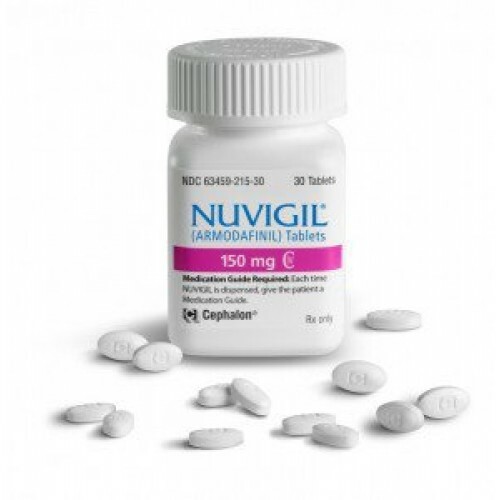 You may have noticed that Nuvigil is available in smaller doses than Provigil. This does not necessarily mean that Nuvigil is twice better than Provigil. It does not mean that a 200mg Provigil is equal to a 100mg Nuvigil. Instead, the difference is that Nuvigil has twice longer half-life than Provigil. The half-life of a drug is a period of time needed for an amount of drug in the bloodstream to be reduced to half of the original amount. In other words, a drug with a higher half-time can last longer in your body than the one with a shorter half-time. Note that the half-time only indicates the effect’s duration; the intensity level of the effect is dependent to how much you consume the drug. Nuvigil has twice longer half-life than Provigil. So, Nuvigil can last twice longer in your bloodstream than Provigil. That’s why you are recommended to take Provigil once in the morning and once again in the afternoon, but Nuvigil only requires once-a-day consumption. For first-time users, choosing the right dose can be confusing. On Provigil, the recommended starting point is the 100mg dose. You can titrate up if you find the dose insufficient to erase your sleepiness. The highest dose allowed per one-time consumption is 200mg, so the total for a day if you are on the maximum is 400mg. Meanwhile, on Nuvigil, the recommended starting point is the 150mg dose. It also allows you to titrate up to the 250mg dose, which is the maximum allowed, taken once daily as needed. For treating work-time sleep disorder, you should take the medication at least 1 hour prior to the start of your shift. To prevent daytime sleepiness, you take it in the morning. Provigil and Nuvigil are usually given for up to 12 weeks, but you should follow your doctor’s instruction because different people have different conditions. For treating obstructive sleep apnea (OSA), you may need to use the drug in combination with a continuous positive airway pressure (CPAP) machine – a machine used to prevent obstruction in your respiratory system when sleeping. Taking either Provigil or Nuvigil alone for treating OSA without addressing the underlying causes will not be effective. You are not supposed to share these drugs. Selling or giving away Provigil and Nuvigil are actions that go against the law and can bring you into a trouble. If you are on Provigil or Nuvigil, you should avoid drinking alcohol. You should also avoid dangerous activities and serious activities that require high levels of alert and concentration, at least until you understand how the medication affects your wakefulness level. Driving, for example, is said to be avoided. That’s understandable, considering that your body and your mind are not fully fit in the first place. If you miss a dose, you should take the missed dose as soon as possible. But you should not take the missed dose if you aren’t planning to be awake in the next several hours. If it is close to the expected bedtime hour, you may abandon the missed dose altogether and continue with the next dose in the following day. Consult with your doctor if you miss a dose of your medication. You should not increase your dose to make up for the missed dose. In case of overdosing, you should call for emergency medical attention right away; overdose symptoms may include confusion, restless or excited feeling, fast or slow heart rate, chest pain, nausea, diarrhea, and hallucinations. Both Provigil and Nuvigil should be stored at room temperature, which is between 68oF – 77oF or 20oC – 25oC. Provigil and Nuvigil have very similar side effects. The first and the most common contraindications of these drugs are allergy and hypersensitivity. The symptoms may come up within one to five weeks after the first dose, and may include: hives; swelling on the face, lips, tongue, or throat; hoarse voice; difficulty breathing and eating; and rash. If such conditions happen, you should seek an emergency medical help right away. The rash symptom especially needs to get serious attention, no matter how minor, because it may be associated to a more severe negative side effect. Tests and studies show that both Provigil and Nuvigil’s liabilities to cause addiction or dependence are very low. They don’t cause such effects if used in the recommended doses, but they do in very high doses. That’s why you should not take either Provigil or Nuvigil over the recommended doses. The most common side effect of both Provigil and Nuvigil is headache, which occurs 15% – 20% of the time. Unlike stimulants, Provigil and Nuvigil don’t cause high blood pressure or palpitations. More common negative side effects known for Provigil and Nuvigil are dizziness, nausea, diarrhea, nervousness, anxiety, and insomnia. Less common negative side effects are gastrointestinal-related problems. Very rare cases of Provigil’s side effects include Stevens-Johnson syndrome (SJM), erythema multiforme (EM), toxic epidermal necrolysis (TEN), and DRESS syndrome. Nuvigil does not have such dangerous cases, but, considering that these two drugs have nearly similar substances, it may have the risk as well. That’s why you should get an immediate emergency help if you experience a severe skin reaction upon consuming either Provigil or Nuvigil. Both Provigil and Nuvigil may have an adverse side effect on hormonal contraceptives for a month after discontinuation. All in all, to avoid the potential side effects, you should always consult your doctor or physician before taking either Provigil or Nuvigil as a medication for treating your sleepiness and drowsiness. Provigil is based on modafinil, whereas Nuvigil is based on armodafinil. The two are similar substances with slightly different chemical structures. The advantage of Nuvigil over Provigil is the twice longer half-life, which means that Nuvigil’s effects can last longer than Provigil’s effects. That’s why Nuvigil only needs to be taken once daily whereas Provigil is taken twice daily. However, due to the longer effect, Nuvigil is best used if you need to stay awake for long continuous hours. For just a few hours, Provigil is the better choice.